Featuring events occurring at comic shops across Canada. Metropolis Comics and Toys will be hosting their 80’s Cartoon Festival. An in-store event showing spooky 80’s cartoons will be held on October 23 at 8pm. High Octane Comics & Collectibles annual Halloween Bash will be returning. Be sure to come down wearing a costume for FREE swag on October 30th! Lucky’s Comics hosted Dave Cooper as he toured the west coast for his new book BENT, published by Fantagraphics Books. Lucky’s has been hosting some great talent lately. Over on the gallery side, Lucky’s Comics is hosting a gallery show for Vancouver artist Ben Raymer titles Wobably. This will run from October 14th to November 4th, 2010. The Opening Reception is tonight (!) October 14th, starting at 7pm. I’m sad to report that Terry Sillman, owner of Talking Illustrations in New Westminister, BC, passed away last week. 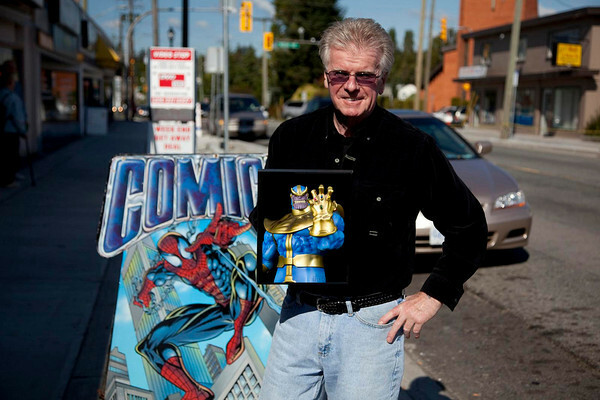 In business for 30 years, Talking Illustrations was a pioneer of the BC comic scene. Our condolences to Terry’s family, friends and customers. Happy Harbor will be hosting a Halloween Costume party on Saturday, October 30, 2010 beginning at 7pm. An evening of live music, costumes, prizes and adult beverages (sorry, no minors). No cover charge, this event is limited to Happy Harbor customers and their guests. In a neat event that I’d love to see other stores steal, Happy Harbor will be hosting a special whiskey tasting event on November 5th. Tickets are $40, available at Happy Harbor Comics vol.1 and Sherbrooke Liquor. The fun starts at 7pm. 924-B South Railway Street S.E., Medicine Hat, AB, T1A 3G4	. The Dragon will be hosting Clayton Hanmer for a Comics For Kids event on Saturday, October 16th . This is an interactive drawing event where kids learn to create comics. Contact the store if you’d like your child to take part. Scott Chantler launches his newest book, Two Generals (McClelland & Stewart), at the The J.A. McIntosh Armoury, 1 Valour Place, Cambridge, Ontario on October 30th, starting at 7pm. Open House from 10am to 5pm. The Dragon will be hosting Scott Chantler for a Comics For Kids event on Saturday, November 13th . This is an interactive drawing event where kids learn to create comics. Contact the store if you’d like your child to take part. He will be signing copies of his newly launched books Two Generals (McClelland & Stewart) and Tower of Treasure (Kids Can Press). I came across a neat little facebook group, remembering the good times at the famous Bakka Books. 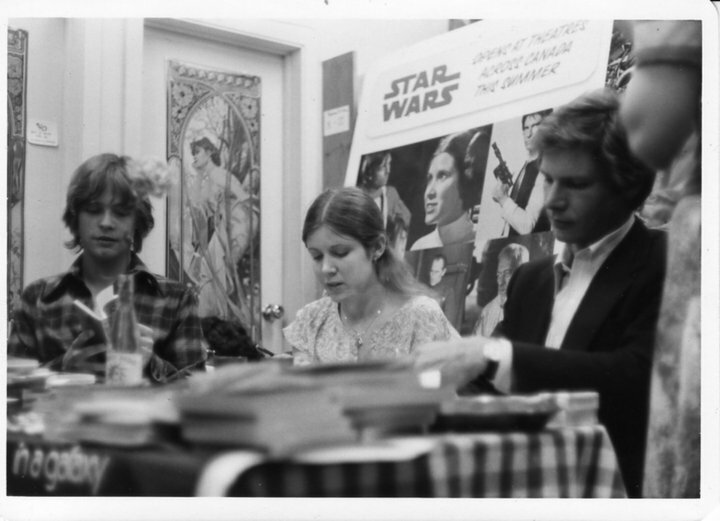 Worth a look for the 1977 Star Wars signing photos! This would have been quite the event, given the Star Wars hysteria of '77 (and beyond). The Gauntlet Comics & Games will be hosting their Grand Re-Opening event on October 23rd, starting at 10am. The store is open, and photos of the new space are online. Myths, Legends & Heroes are selling Skullkickers #1 for $15. Heroic Dreams are celebrating their 1st Anniversary. The French Consulate, The Beguiling and L’Alliance Française have put together a Conversation with Marc-Antoine Mathieu on Monday, October 18th, 2010, 6:30PM-9PM at L’Alliance Francaise, 24 Spadina Road (north of Bloor) This event is free to attend. The Beguiling are hosting the Kill Shakespeare writers Anthony Del Col & Conor McCreery for a discussion of the series to coincide with the launch of the TPB, reprinting issues 1-6. Rogues Gallery Comics will be hosting a Halloween bash. They will be showing the first episode of The Walking Dead TV show, then the party continues. Toronto loses another long time comic retailer. On October 30th Excalibur Comics will be closing it’s doors. September 18th – special guest Eric Gordon (aka Sirkowski) for the launch of his Miss Dynamite book, collecting 20 years worth of strips. Strange Adventures recently hosted Dave Sim at their store. Photos are posted.